Leo Ronan has lived in Neponset, or at least as close to Neponset as possible, for all of his 77 years. Mr. Ronan has been married to Patricia (Sullivan), who grew up on Chickatawbut Street for 48 years. They have five sons, Patrick, Dennis, Leo, Jr., Michael, and Brian, who lives on Hilltop Street. Leo was born on Newhall Street and lived there through his childhood, adolescence, and young adulthood. He attended Saint Ann School. After graduating from Saint Ann's, he went to Boston Trade School. "It was during the Depression so my father insisted that I learn a trade. I took Sheet Metal. I worked for A. Donnelly Advertising." Mr. Ronan entered the military service as a member of the United States Army, serving as a paratrooper in the 101st Airborne Division in the Second World War for three years. "I was all over Europe, France, Belgium, Holland." 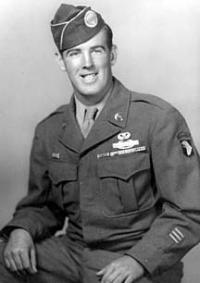 Mr. Ronan was severely wounded in operation Market Garden. He was captured by the Nazis and spent five months as a prisoner of war. He spent his 21st birthday in the POW camp. Mr. Ronan recalls being at the Nazi POW camp when he learned that the war in Europe was over. "It was about six weeks from the time we knew the war in Europe was over before we could actually go home." When Ronan was back on home soil, recuperating and preparing to serve in the war in the Pacific, he learned that the war had ended. Although Ronan is unnecessarily modest about his impressive war record, his loving wife Pat is willing to tell her husband's story. "He jumped in the D-Day invasion and he fought all the way through the Battle of the Bulge. On July 15, 2000, we were invited to the Black Falcon terminal to the JFK aircraft carrier where Leo and other soldiers from around the country were given awards from the French Government for their role in the French Liberation. It was very nice." Of his years in World War II, Mr. Ronan says that the worst time was killing another human being and the best time was learning that the War was over. Of all of his illustrious military distinctions, which include two Purple Hearts (he was given the award, but never sent the actual medals) Mr. Ronan says he is proudest of this: "I am happy that I made it home alive." And when he made it back home to Neponset, Ronan says that he and fellow WWII veterans enjoyed some "R&R" time. "We were in the 920 Club. We could take nine months off, but continue to collect our military pay, which was $20 week. But you had take classes or training of some kind to collect. So we took classes at BU, Burdett, Harvard, MIT. It was so crowded. A lot of times you ended up sitting on the floor." Ronan continued his studies and received a degree in social work. He worked as a Social Worker at the Long Island Hospital and was subsequently appointed Acting Director of the Long Island Hospital and the Mattapan Chronic Hospital. When Mattapan Chronic closed, Ronan went to work in the city of Boston's Health and Welfare division. In addition to furthering his education when he came home from the War, Ronan made it his priority to foster the camaraderie of his fellow veterans. "When we came home, they started the posts. A lot of people were involved in starting the Neponset VFW Post. Pat Kelleher was instrumental in getting the land for the post. Some of the other founding members were Jim Maloney, Marty Ricco, Cliff Sweeney, Ed Biliecki. In the process of starting the post we learned a lot of Neponset history." Mrs. Ronan adds that auxiliary members like Mrs. Duchaney and Mrs. Timmons also played a major role in establishing the post. "They held a mortgage burning ceremony when it was all paid." Pat Ronan recalls that the post was formerly a small branch of the Boston Public Library. "I remember that when the veterans first took it over, it still looked like a library with a big picture window in front. There was a trolley stop outside and when we would wait for the trolley, the vets would be sitting at that window in their chairs, looking out at you. Sometimes, we'd just walk up to the Coffey Street stop wait for the street car." Leo Ronan was instrumental in the annual Memorial Day parade. Ronan was not able to attend last year's parade because of poor health, but was active in every year prior. He talks of how the parade crowds waned over the years, "It is really pathetic. We worked so hard on that parade every year. We looked forward to it. You got a chance to see everyone. It used to be that you would see these people at the parade, then at Mass and at the store. But the parade gave you a chance to talk. Then it got to the point where we would only see people at the parade. If you stopped seeing them there, you would ask, 'Is so and so still alive?'" The sad reality is that these brave and humble men of the greatest generation that ever lived are growing old. Mrs. Ronan contemplates the future of the Neponset Post's VFW affiliation. "In order to renew the charter the charter, you need to have veterans. Once they are all gone, the VFW will disassociate. Of the founding members of the Neponset VFW post, only three are still living." Even though the faces are changing, Mr. Ronan still says that he spent the best times in his life in Neponset. "I liked organizing the parade and the Neponset Reunion (a tradition that is being carried on by Jim Maloney, Jr. and Mike Crist). I liked playing ball at the Garvey Park. We would rush home from school, throw on jeans, a dirty t-shirt, and just play ball for hours. There are no better people on the face of this earth. People don't realize how lucky we are. For a kid growing up, we had everything; the park, Tenean Beach, the Church, everything was right there." Fran Murphy, a local historian and World War II veteran, attended Saint Ann School with Leo Ronan. "Leo has made a great contribution to the people of Boston. If you needed anything, you went to Leo. He is the brains, the bed-rock of the Neponset VFW Post. He is a very low-key man." Michael Ronan, Leo and Pat's fourth son, is a veteran of the Gulf War. "My Dad is my hero," Michael says. "He is very humble. He never talked about the war. Around the time of the 50th anniversary of D-Day, a reporter from the Globe came out to interview him. He never said anything about it to my brothers or me. He always encouraged us to get involved in the community, to vote, and to serve. I think that his influence is evident in the professions that my brothers and I have chosen; I am a Boston Firefighter, Leo is a Boston Police Officer, and Dennis is a school teacher." Dennis Ronan says of his father, "He has had a profound influence on all of us. He is a tough old guy." Brian Ronan is the youngest of Leo and Pat's five sons. He says that if there is one thing he can say to sum up all that his father has taught him over the years, it is, "Look out for each other." Although Leo Ronan's health is poor, some things will never change. His wife Pat still dotes on him as if they were two newlyweds and Leo's eyes still gleam with all of the zest for life of that young kid who just won a game of football at the Garvey. While he would never tell you himself, Leo Ronan is a hero. He was a hero on the beaches of Normandy, a hero to the sick patients he helped at area hospitals, and he will always be a hero on the streets of Neponset.